One of the things we completely forget to do when trying to live a healthy lifestyle is change our skincare, body care and household products to chemical-free versions. You may make the excuse that it’s too expensive, but when it comes down to your health…well, health is priceless! And really the bottom line is you either pay now or pay later with doctor visits. In light of this, see the transition to clean bodycare/beauty as a gift to yourself and your liver. Make it fun and get excited because you are making a life long investment in longevity and optimal living. 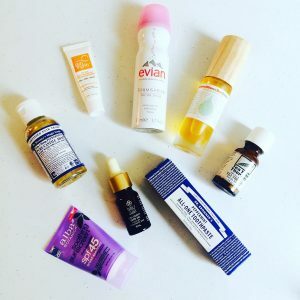 In this post, I will share with you some of the cleanest body & beauty brands that make the transition from toxic-to-clean super easy. These brands are high quality and offer much more than your outdated drugstore products, they offer you optimal health! The links below will allow you to look up specific products and ingredients to help you make better decisions before purchasing products. Make it your goal as soon as you run out of a toxic product to research a better product and replace it. Consider the upgrade to quality products in your life, as a means to optimize your health because you are worth it! The key is to look for products that contain ingredients you recognize, can easily pronounce, are organic, food-grade and wouldn’t be hesitant to eat! Local natural food grocery stores, as well as larger supermarkets like Sprouts and Whole Foods also carry non-toxic personal care and beauty products, which makes traveling, convenience and health so much more achievable. Everyday our body comes into contact with toxins…pollution, medications, genetically modified foods, cosmetics, pesticides, alcohol, cigarette smoke, household chemicals, etc. and these exposures add up. In light of this, our body has to work that much harder to process and eliminate these toxins. However, by being mindful, identifying and getting rid of the avoidable toxins, over time allows the body to balance itself and to function that much more efficiently. So often people are prone to sickness (i.e. colds and flus) and this is simply because the body is working overtime to eliminate the crap we put in it or on it everyday. Therefore, the body doesn’t have the time or energy to focus solely on crushing your cold virus or flu, etc. Bottom line: Change your Body-Care & Skin-Care! No more excuses. By changing my diet and following Kristin’s recommendations and key supplements, I feel so much better and it changed my life. She helped me to lose the extra 15 lbs I had gained and to see how my prescriptions were leaving me deficient in key vitamins important for depression and anxiety.